In a recent update, Bumble introduced a feature which enables users to see if other people have swiped right on them before making the decision themselves. If this sounds familiar, it's probably because Tinder just released a very similar feature in their most recent major update, only their version is called Tinder Gold, and it's an upgraded, enhanced version of the entire Tinder experience, rather than a single feature. In Bumble's case, it takes the form of a small heart icon on the profile screen of a potential match. Tap it, and a swipe becomes a SuperSwipe. Once that person gets around to seeing your profile, they'll get a little icon indicating that you've already liked them. Tinder Gold is different, in that it allows you to see everyone who has swiped right on your already whether they chose to indicate it or not. However, even before Tinder Gold, there was the Super Like, which is identical to SuperSwipe in almost every way. Regular users get one Super Like per day, while paid subscription users get five. In Bumble's case, each SuperSwipe costs one 'Bumble Coin', a currency launched specifically for use with this feature. Each coin costs $0.99. More paid features are set to be launched later in the year, including one which allows users to 'jump the queue' and appear sooner on other people's lists. Like Tinder, Bumble already has a premium subscription service as well and funnily enough, one of the subscription features is called 'Beeline' - a list of users who have already swiped right on you. This has been available on Bumble since last year, but Tinder have only just wheeled it in. So, in sum, both apps have been taking ideas from each other, which kind of nullifies any crowing about plagiarism. The more important thing to focus on is the micro-transactions. Bumble aren't the first dating platform to incorporate them, but the monetisation of the app has always been secondary to enhancing the brand and getting it out there into the world, on buses, at music festivals and even in branded hangout spaces. This is phase two, now that Bumble are confident that everyone knows who they are and what they stand for, they're finding ways to increase profit. Unlike other kinds of social media platform, they can't rely on advertising. 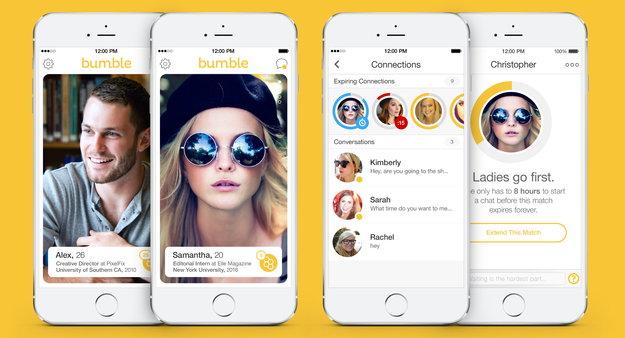 If they keep bringing out Bumble Coin features at a steady rate, Bumble could set an important example for the dating app market.